For this project I chose for a 6 inch three blade propeller. A 6 inch propeller on a 25cm frame will give me a total width of 40cm. The 6 inch 3 blade prop will produce the same thrust as a 7 inch 2 blade propeller. So I get the same thrust with a smaller surface, but remember that the 6 inch 3blade prop will consume a bit more amps than a 7 inch 2 blade. Hobbyking has introduced a new range of very nice multicolor three blade propellers. The motor for this project is again a nice product from hobbyking called the "C20 brushless Outrunner 1550kv" It is a nice looking 26gram motor that should give enough power for my H quad. 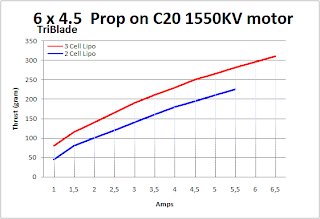 This motor can be used with 2 cell or 3 cell lipo's. The motor mountholes on the bottom of this motor are a bit strange because they do not follow the 16,19mm standard. The holes on this moter are 14 and 18mm seperated. The srews are M2 on the 14mm holes and M2.5 on the 18mm holes. 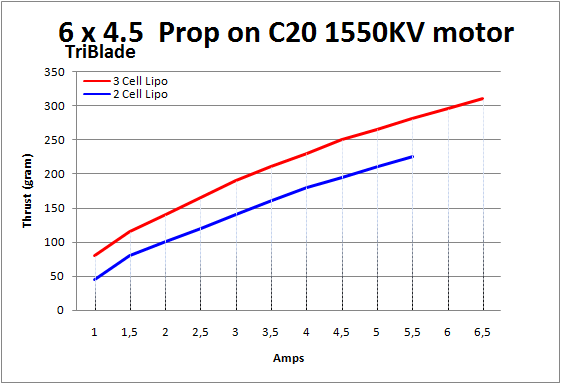 The next graph shows a full range benchmark for the combination of this motor with this prop. Red line is test on a 3 Cell battery. Blue line is test on a 2 cell battery. The end of the blue line is really at max power. For the red line I stopped testing a 6.5 amp. On my next blogpost I will post the result of max thrust on 3cell.